Outside of the well-worn path of biography and autobiography, non-fiction has traditionally been one of the most frustratingly under-developed areas of the comics medium. But in recent years, more and more creators have set out to explore the potential of the comics form for non-fiction - discovering whole new sub-genres in the process. Perhaps one of the more unexpected, and acclaimed, of these new comics sub-genres is war journalism. Maybe the increasing number of high-profile wars involving the US military has spurred this trend on. Whatever the cause, the diversity of form, content and approaches to their subject matter adopted by various cartoonists demands attention. It's at this juncture that I should acknowledge the enormity of war as a subject and the impossibility of ever doing it justice. 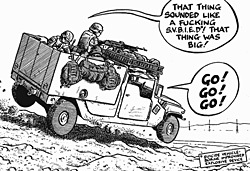 It's probably equally impossible to do justice to the subject of war journalism in comics in a brief overview like this, which is why I've chosen to focus my attention on just three examples: Joe Sacco's COMPLACENCY KILLS, a strip originally commissioned for the UK newspaper The Guardian; Ted Rall's TO AFGHANISTAN AND BACK; and Karl Zinsmeister's COMBAT ZONE. They are three very different works, each told in very different styles and formats, covering completely different conflicts - or, perhaps, completely different moments in the same overarching conflict; the US-led 'war against terror'. The three creators experienced their wars in very different ways, and they also span the political spectrum. Of the three creators, Joe Sacco probably requires the least introduction, and has gained the greatest reputation for his work. In his previous graphic novels - PALESTINE, an examination of life in the West Bank and Gaza Strip, and SAFE AREA GORAZDE, a recounting of his experiences in one of the UN-mandated safe areas at the tail-end of the wars that marked the break up of the former Yugoslavia - Sacco virtually created the form of documentary comics. The style and format he adopts borrows heavily from the conventions of autobiographical comics. His use of black and white artwork, a motif of low-budget, independent, autobiographical comics, seems to add some indefinable quality of authenticity to the work, akin to the use of black and white photography. Something else that Sacco appears to have picked up from autobiographical comics is the attempt to document both the rhythms of daily life and its minutiae. The lives lived by ordinary people in extraordinary circumstances is a recurring motif in his work. Much of Sacco's previous work draws from his experiences in the twisted debris of post-conflict environments. However, the eight-page COMPLACENCY KILLS captures Sacco's account of his time out in Iraq, in an environment that was still intermittently very hostile. There, he was embedded with a US Marine Mobile Assault Platoon (MAP) on patrol in their battle to keep supply routes open in the face of a continuing insurgency. It could easily be argued that such a labour-intensive art form as comics is particularly ill-suited to the fast-moving world of war reporting. There is probably more than a little truth to this claim. But in his strip, Sacco demonstrates that comics are superbly suited to capturing a distillation of the moments - in staccato snap-shots - that make up a marine's life in a war-zone. The moments of boredom and monotony, where the cartoonist share the bunks, meals, coffee and even the care packages of the enlisted men are punctuated by terrifying, adrenalin-pumping moments where the men face yet another potential threat. As the strip's title suggests, the Marines are facing an enemy even more insidious than the insurgency: complacency itself. Interactions with Iraqi civilians are brief and usually conducted at gunpoint, as Marines rapidly seek to distinguish suicide bombers from ordinary Iraqis driving in their cars. If Sacco is unable to fully document the lives and experiences of such ordinary Iraqis under the circumstances, it is at least an inability that is not hidden from the reader. 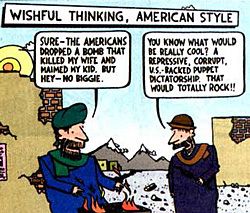 In contrast to the comparative safety Sacco enjoys as an embedded correspondent in a military unit, Ted Rall seems to exhibit an almost reckless haste in aiming to get to Afghanistan on his own to see the reality of the early weeks of the US-led war on the ground. Rall's book about his experiences, TO AFGHANISTAN AND BACK, is a bit of a hotchpotch of standard text essays, (commissioned by the VILLAGE VOICE) newspaper style strips and a longer comic strip section termed a 'graphic novella'. The cartoonist is the first to admit that the different forms reflect both his goal to emulate the documentary comics style of Sacco and an urgent attempt to rush his account into print and out to the public before the news agenda once again switched away from the central Asian republic. It's worth emphasising that Rall was travelling as an independent journalist, with little or no protection and no back up, while both Sacco and Zinsmeister had the benefits of the protection of the US army. Given his vulnerability, and proximity to the actual fighting, it is probably quite understandable how little of it Rall reports on - if you hear gunfire or shelling in that situation, the last thing you want to do is run towards it. This is perhaps why TO AFGHANISTAN AND BACK takes the form of a cloying portrayal of a journalist's life in the midst of a particularly lawless war. He is able to observe elements of daily life from the inside a war zone in a way that embedded journalists never could. He captures the insights of the Afghan civilians, various militiamen, and his fellow reporters as they share all the moments of flea-bites, haggling and near-death experiences of war zone living. While Rall's overt political commentary and the extent to which his graphic novella echoes the essays might annoy some, it certainly adds a sense of focus to his work. Each expository point or recalled event is illustrated by a sequence in the graphic novella. But beyond the forceful style in which his work is portrayed, Rall possesses the extra authority of someone who didn't just go Afghanistan, but did so independently and unmediated by the strictures of the US military. Perhaps the most ambitious of the three books, COMBAT ZONE was originally commissioned by Marvel Comics from journalist and editor Karl Zinsmeister. He served as an embedded journalist with the 82nd Airborne during the early days of the US-led invasion of Iraq, an experience he wrote about in his book BOOTS ON THE GROUND. COMBAT ZONE, his graphic novel, is at least partly based on the same events. Originally envisaged as a five issue limited series, the title was cancelled and subsequently re-scheduled as a single volume, collecting all the material that would have comprised the limited series. In his foreword, Zinsmeister admits to changing various elements of what he observed, to provide a "more condensed read". 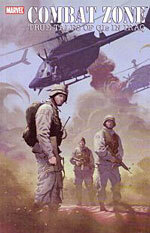 It is easy to see why the journalist felt the need to do this - whereas Sacco and Rall focus on capturing brief individual moments and interactions and placing them in a wider context, Zinsmeister is attempting to portray great sweeping movements - complete military actions and missions undertaken by the 82nd Airborne shown from the multiple perspectives of various soldiers involved. It's an immense task, and the result is an inevitable compromise. In focusing on the larger picture, telling the story of the battle rather than documenting moments in the lives of individuals fighting it, Zinsmeister gets bogged down in narrating an overview of larger events, rather than a faithful recording of personal experiences of the war. Unlike Rall and Sacco, Zinsmeister is both a first-timer to scripting comics, and is unable to illustrate his own scripts. As a result, COMBAT ZONE is an inherently less reliable form of documentary, with the artist one stage removed from the events that he is portraying. Though the artist lacks the authority of having been to Iraq himself, there is no doubting the skills of Dan Jurgens, COMBAT ZONE's artist. He is a veteran comics artist who specialises in superhero comics. Unfortunately, COMBAT ZONE isn't a superhero comic, and many of the conventions of superhero comics, the most overblown and exaggerated of fictions, become an active liability when attempting to document an event with a degree of journalistic integrity. This artistic approach further shunts the perception of the book away from journalism and into a hyper-real realm more akin to Hollywood adaptations, events 'based on a true story'. Even the use of colour, an indistinct muddy distraction in the reduced palate of the desert and camouflage fatigues, seems to suggest fictionalisation rather than documented reality. In both Sacco and Rall's books, our cartoonist/reporter is present at the centre of the narrative, recording and recalling their impressions. In COMBAT ZONE, Zinsmeister has been almost surgically removed from the events he his relating. A few officers refer to the presence of a journalist, and there is the silent figure of the pressman in some panels, but he doesn't really interact with the unit to which he's been assigned. There could be several reasons for this - putting the lives of the troops at the centre of the book, for example - but the choice also seems like another step away from straight documentary, the god's eye perspective of narrative cinema replacing the eye of a journalist on the ground. However, If COMBAT ZONE is a failure as a piece of war reporting it is at least a work that fails in an interesting way. Zinsmeister's book, along with the works of both Sacco and Rall, charts some of the limitations, as well as the strengths, of comics as a form for reporting and documenting events. It may be the case that comics aren't quite capable of fully documenting wars, but film, TV, books and newspapers also fail at that task in different ways. War reporting in comics might be imperfect, but comics can prove exceptional at capturing moments in the lives of people in a war zone. TO AFGHANISTAN AND BACK is published by NBM. COMBAT ZONE is published by Marvel. COMPLACENCY KILLS is available online as a free 36MB pdf download. Rob Cave is a London based editor and freelance writer.